Leadership is a relationship between those who aspire to lead and those who choose to follow. There are countless examples of visionary leadership in sport. There are also numerous indicators today of how important visionary leadership will continue to be in the future for addressing the many issues and challenges faced by sport leaders across the industry. Fink and Pastore (1999) introduced a framework for diversity management in sport based on an integration of research studies from business management published in the 1990s. 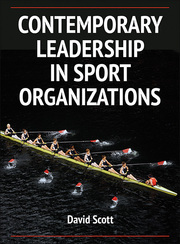 This text provides a comprehensive understanding of the complex topic of leadership in sport through a presentation of foundational and contemporary research, numerous practical examples and analytical exercises, and thought-provoking self-assessments and quotes. Contemporary Leadership in Sport Organizations blends research on leadership with practical application of the skills and knowledge that students will need on the job. This text provides sport management students with a comprehensive understanding of the complex topic of leadership in sport through a presentation of foundational and contemporary research, numerous practical examples and analytical exercises, and thought-provoking self-assessments and quotes. Practical examples provide opportunities to critically consider the concepts under discussion. Chapter-opening objectives, as well as pre- and postchapter self-assessments, help students measure their understanding of chapter content. Specific examples and case studies applicable to a broad range of sport leadership roles put research into practice. On the Sidelines stories, Your Thoughts boxes, and questions at the end of chapters are incorporated throughout the book to provide examples and stimulate discussions applicable to a broad range of sport leadership roles across youth, amateur, intercollegiate, professional, and commercial sport organizations. Part I of the text offers a leadership primer, introducing the elements of business and educational environments in which sport organizations operate. Students will learn how leaders in sport organizations typically assume both managerial and leadership roles and how these roles integrate and diverge, and they will review the historical foundation and evolution of leadership theories from the academic literature. Part II covers applied leadership thought and action and how leaders can become more effective in addressing critical challenges of the present and future. Key topics such as decision making, organizational change, emotional intelligence, vision, strategic planning, and crisis management are discussed. Professional growth and development are the focus of part III, considering multiple approaches and tools for improving self-understanding, personal development, and leadership mentoring. Contemporary Leadership in Sport Organizations provides a foundational and contextualized body of information regarding thought and practice in leadership to inform and inspire students of sport management. Whether preparing for leadership roles in sport organizations or preparing for teaching, research, and academic study in the field of sport leadership, students will gain a solid understanding of the theoretical foundations of leadership in sport and how it is applied to sport-related organizations of all types and sizes. Management and Leadership: Mutually Exclusive or Integrated? Why Is EI Important for Sport Leaders? How Do We Learn to Lead? Primary text for upper-level undergraduate or graduate sport management courses in sport leadership; reference for academic libraries and researchers in sport management and leadership. David Scott, EdD, is associate dean for research and information management in the college of education at the University of New Mexico. He received his bachelor of science in physical education from Texas A&M University, his master of science in physical education from Midwestern State University, and his doctor of education in physical education with specialization in sport administration from the University of Northern Colorado. Scott began his career as a teacher and coach of multiple sports in public schools and eventually coached intercollegiate football at the NAIA and NCAA Division II level. His university teaching has included undergraduate and graduate courses in exercise science; sport leadership; organizational theory for sport; administration of sport personnel; public relations in health, physical education, and health; principles of coaching; and management concepts for sport and fitness. He has also advised numerous doctoral dissertations, graduate students in sport administration, athletes, and undergraduate physical education majors. Scott’s research emphasis is leadership and organizational behavior in sport organizations, with a secondary interest in predictive data mining for sport management. He also has an interest in coaching and athletic administration education and conducts workshops dealing with various aspects of leadership and management training for coaches and athletic administrators. He has published research and conceptual articles in several refereed journals, including Journal of Sport Management, Quest, International Journal of Sport Management, International Journal of Sport Management & Marketing, and Journal of Contemporary Athletics. He has also published several book chapters and has presented at multiple state, national, and international conferences. Scott is a member of the North American Society for Sport Management and the American Alliance for Health, Physical Education, Recreation and Dance. In his free time, Scott enjoys trail running with his Alaskan malamutes, racquetball, tennis, hiking, and trout fishing. All ancillary materials for this text are FREE to course adopters and available at www.HumanKinetics.com/ContemporaryLeadershipInSportOrganizations. Presentation package. Includes over 200 PowerPoint slides of text and artwork from the book that instructors can use for class discussion and demonstration. The slides in the presentation package can be used directly in PowerPoint or printed for transparencies or handouts for distribution to students. Instructors can easily add, modify, and rearrange the order of the slides as well as search for images based on key words. The presentation package is also available for purchase • ISBN 978-1-4504-6577-9.